Treasure Chest - a voice of New Life Church in West Linn, Oregon: No Whitewashed Tombs! Saturday was a fun day at New Life Robinwood. 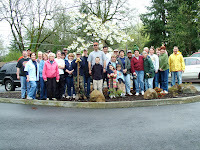 Over 30 people showed up for our Church Beautification Project (AKA Work Day). For over 5 hours these volunteers worked very hard to make the church look beautiful for Easter. It struck me that this was one of our best attended non-Sunday events in a long time. The church property really looks great! We truly do want to put our best foot forward to the community on Easter. Woe to you, teachers of the law and Pharisees, you hypocrites! You are like whitewashed tombs, which look beautiful on the outside but on the inside are full of dead men's bones and everything unclean. In the same way, on the outside you appear to people as righteous but on the inside you are full of hypocrisy and wickedness. Would you take some time this week to prepare your heart to worship Jesus on Easter Sunday?